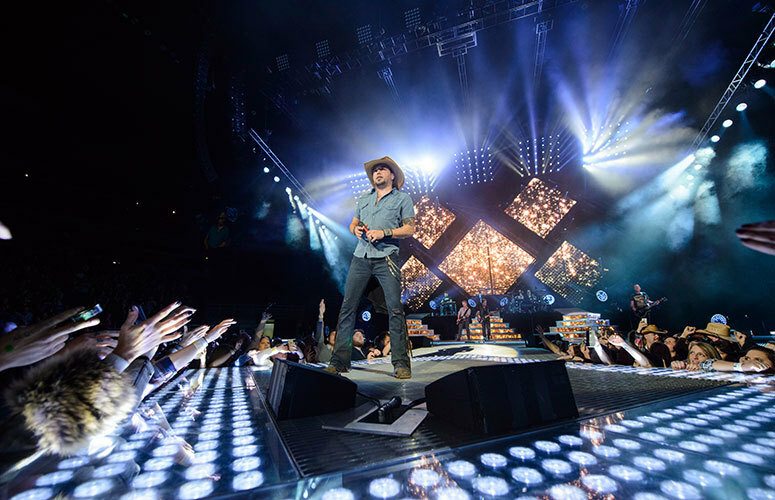 Jason Aldean is known for his successful music career, but what about his hunting habits? Did you know he schedules tours around whitetail season? Jason Aldean has spent this winter in the woods relaxing, reflecting and, most of all, hunting whitetails. It's also possible he's spending this week at the ATA Trade Show in Indiana, an event he's attended in the past. Before grabbing his bow and making his way up a tree, Aldean spent 2016 back at the top of The Billboard 200. Aldean’s seventh studio album, They Don’t Know, marks his third consecutive No. 1 record, and the country music star has already won the ACM Award for Top Country Song (“Lights Come On”) and more are likely to follow. We recently had a chance to catch up with Aldean and talk deer hunting. Here's what he had to say. WJ: Everyone knows about your music career and your outdoor lifestyle, but how did you get started hunting? Aldean: My dad and grandfather used to take a hunting trip to Georgia every year for Thanksgiving. My dad would come to Georgia for a couple weeks with my grandfather and they would hunt. Once I got old enough to go with them is when they started taking me. It was kind of one of those things when we did that for a while, but my grandfather passed away and I got out of it for a long time. I’d hunt here and there, but then I met Adam LaRoche from Buck Commander and he kind of invited me out to his ranch to hunt one year and I became friends with him and got involved with the Buck Commander stuff and eventually became an owner in that. But once I met Adam I got into bowhunting, which I had never done before. That was a different type of hunting I’d never done, which sort of rekindled it for me. It made it exciting again so I went head first into it at that point. I’d go out with those guys and having a lot of fun. WJ: How long was your break from hunting? Aldean: I got out of it probably at 16, 17, something like that. It wasn’t until I was in my late-20s until I got back into it. I lost the passion until I met (the Buck Commander) guys. They had a different way of hunting and a different vibe with camp. Even the camp was fun and crazy and everyone was having a good time. It was just a whole different world for me than anyway I had every hunted. It just sort of re-soaked the fire for me. WJ: What game is your favorite to hunt? Aldean: Whitetail is my favorite. It always has been. A lot of the guys do the Western-style hunts, which I’ve never really done, so I don’t really do that. I like to turkey hunt in the spring and deer hunt in the fall. When bow season comes in, that’s my favorite — early-season bowhunting. WJ: How has your music career affected your hunting schedule? Aldean: My lifestyle and the way my life works these days is so hectic and so crazy that I’m constantly on the road traveling, so hunting season is almost therapeutic. I get a chance to get out in the woods and it’s quiet. It gives me a chance to reflect on the year a little bit and reflect on what’s going on. A lot of times things are going so fast you don’t have a chance to sit down and enjoy it or kind of realize things that are going on. For me that’s what hunting season does. It gives me a chance to go out, relax, not have anything else to worry about and whether you see a deer that day or bag a big buck, it’s just nice to be out there not worrying about anything else for a change. WJ: How often are you able to get out into the woods? Aldean: I typically schedule my tour somewhat around hunting season. We go through the end of October then I have November, December then I sometimes hunt a little into January. In those two months I try to go as much as possible. We usually have two or three group hunts per year when we’re all in camp, so that’ll be three or four weeks during that point when we’re in camp, but if I’m home in Nashville I try to get out to my place about an hour away once or twice a week. I also have a couple of leases that are about five minutes from my house. So I try to get out as much as possible, but sometimes it’s a little tough because other times things take precedent. I have two daughters that play sports so if they have games then that comes first. WJ: How’d you get hooked up with the Field & Stream line? Aldean: From my standpoint, one thing I’ve always been adamant about is I never wanted to have a partnership with someone that didn’t make sense or something I didn’t believe in or something that didn’t fit my brand. Obviously Field & Stream is a brand that’s been around forever and to me it’s almost sort of part of Americana at this point. They’re big on tradition, but they’re products are also great. I’m not going to go out and put my name on a product that’s not good in quality. Being partners with them was a no-brainer for me.